I called Varen this morning. 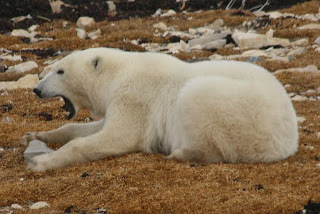 It has been hard having no cellphone signal since we arrived in Churchill. You realise how much one relies on simple smses while away (well, I do ... 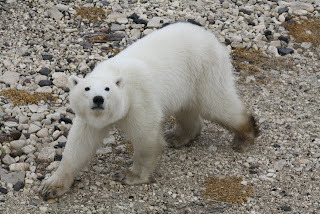 I like to know what he's up to at home and how the bunnies are and it's especially hard to to have been able to gush at him about our fabulous first Tundra Buggy Day's sightings and the dog-sledding!) Oh, the little things we take for-granted these days like being able to keep in touch with a loved one. Today was our 2nd day on the Tundra Buggy. I really wasn't sure what to expect since it was very misty this morning and after we'd had such a brilliant first day ... Well, one can't help but be greatful that the first day was so fabulous and we weren't entirely reliant on our 2nd day of viewing for some fabulous Polar Bear sightings. I would've hated for that to be the case, imagine you see nothing on the first day-out, what pressure that puts on your 2nd day. But I need not have worried. Our second day was as brilliant as our first, but in a completely different way. If it hadn't been in a different way, it probably wouldn't have been as good as the novelty of bear spotting was definitely wearing off with @clairam and I coming up with nick-names for all the bear-spotting by midday: Do not stop the Buggy for "Binocular Bears" (the ones that are so far away, you can only spot them clearly thru a binocular ... so you definitely can't get a decent photo of them!) 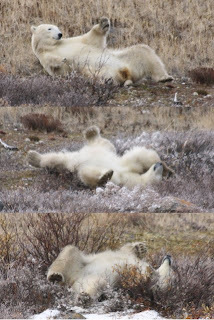 or "Boring Bears" (the ones who are just lying around not moving at all, we'd already seen enough of them). But *definitely* stop the Buggy if you spot any "Baby Bears" (obvious enough!) 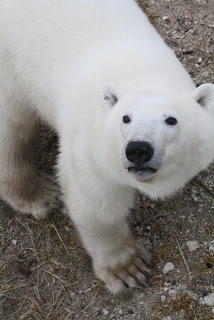 or "Bonus Bears" (the entertaining ones, moving around, making for good photos). 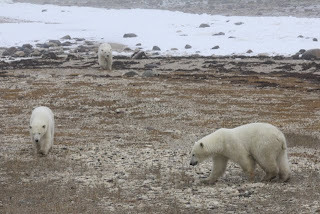 Our 2nd Tundra Buggy day had pleny of the latter two Bear-types ... although we didn't see another Arctic Fox or Hare ... but did apparently spot a Willow Ptarmigan (as opposed to the Rock Ptarmigan from Buggy Day 1). I'll be honest and say the bird was only spotted as we were headed back to the Buggy launch-site (yes, their word, not mine) so I wasn't especially captivated. Anyway, back to Day 2: It took a little while before we even saw a bear ... and even that wasn't amazing (I guess you see more the further from the launch-site you get, hence it usually takes a while to see the first Bear of the morning) and as I said earlier, it doesn't take long to become complacent about seeing far-away Bears (and at this point I still didn't have especially high hopes for the day considering the misty weather). 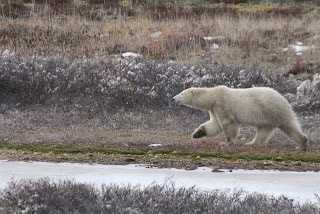 But, Pyro-technic Bob heard a tip on the radio (nothing specific as they actually don't radio each other to tell them where the Bears are because you don't want all 18 Tundra Buggies in the same place at one time) and we sped off to another spot and had an absolutely incredible experience with the first cub-sighting of the season. 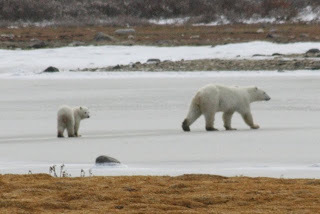 There was a Mother Bear with her two 20 month old cubs (cubs stay with their Mom till they're about 22 months and Churchill is the only place around the world where Polar Bears have more than one cub at a time). After we first stopped to watch them, they wandered quite a way off from us but then ended up coming right up to the Buggy where I was standing on the outside observation deck! Even with the telephoto lens zoomed all the way out, I was too close to them to fit a whole Bear into the photo frame - how awesome is that?! We stayed with these three for ages just enjoying the experience. 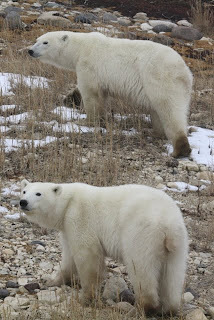 When we eventually moved on, we spotted another Mother with her much smaller 10 month old cub (just one this time), but she wasn't coming anywhere near us with him. A little later we came across another 3 Bears in close proximity (often when there is a litter of more than one cub, and they're old enough for their mother to have left them, they'll stick together until they reach sexual maturity). One of them was quite the little showman and was rolling around for for ages - incredible to watch! I really need to find some easy-to-use (and free!) stop-frame animation software to put these together so you can watch the full show. It doesn't sound like much when written down, but it definitely added up to another completely worthwhile day on the Tundra! Later I popped by the grocery store again so I could try the different flavours of Fanta I'd seen there: Fanta Cream Soda and Fanta Red Tangerine (this is another overseas quirk of mine). The Cream Soda came in a bright pink can and wasn't at all like our Creme Soda (although I haven't had that in years! ), it was almost like a bubblegum flavour. The Red Tangerine tasted just like naartjie. I also managed to find my momento item. 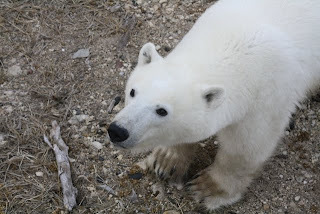 I've gone with 2 Polar Bear drawings by a local artist which I'm hoping to have framed with some of the photo's I've taken on this trip because there really are some amazing ones! We had our last group dinner at the Seaport Hotel. I decided to try the Arctic Char this evening, but it really wasn't up to scratch. @clairam's tasted and looked completely different to mine - although we ordered the identical meal!! But I guess it's tricky preparing a meal for 30 in a town that size. I did try Alexander Keith's India Pale Ale at dinner. I was hoping it'd be a little lighter than normal beer (like cider ... being "pale" and all :P) but it was actually more like Carling Black Label! Made me think of Gum. I hate our SA Cream Soda. I wonder if I'd like the pink one? So glad you got to see loads of baby and bonus bears on day 2.